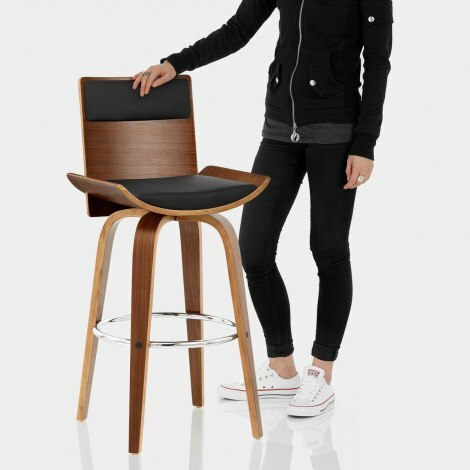 The Harper Bar Stool Walnut and Black will take your breath away. Sensational on any surface, this beautiful stool showcases the best of old and new alike. A treat for the eyes that is also strong and supportive, the Harper enhances its surroundings in style. The wooden seat sports a black faux leather backrest pad and matching seat pad, adding comfort and rustic warmth to the design. Fixed at bar height, it can also swivel 360 degrees, combining efficiency with adaptability. 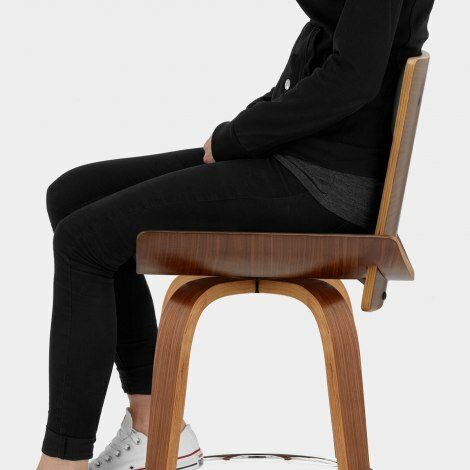 Matching the seat, the frame also has a walnut finish and each leg is formed of sleek bentwood. Additionally, a polished chrome circular bracing bar doubles up as a footrest, elegantly re-enforcing the item as well as helping the Harper to flourish anywhere. "Looks gorgeous, comfy, good back support"
Great quality stools for a very fair price. Every part was really well packed, with plenty of soft protection around them. Easy to put together - I managed to do it all by myself. Our friends have commented on how stylish they are. Very comfortable to sit on for long periods at a time. Excellent speed of order processing and delivery - I wouldn't hesitate to buy from Atlantic Shopping again. Really easy to assemble. Look fantastic at our new breakfast bar. Comfortable and practical with the 360 degree turn on the seat. Thank you. Easy to put together and seem a reasonable quality. Was delighted with my bar stools, they look really expensive and very comfortable. Delivered quickly and the packaging was excellent (no missing parts) easy to assemble and a good price. Am really pleased with the bar stools, they look really stylish, are good quality for the price. They arrived flat packed but are easy to put together.